This filter allows you to set your own style for the default obit list. The obit list array is passed in the filter so you can loop it and display the data however you want. This is a filter for the main obit page, by default we justify the image left and have the obit to the right. With this filter you can lay out how you want. We give you the obit array to work with. This allows you to add a menu item to the obit page of a user. Change the top part of the obit page, this section has the name, vet status, burial and death dates. The obit array is also passed so you can put any information you want here. This is to create the content of a new tab, best if used with “wpfp_frontend_top_obit_menu” to create the tab link. Whatever you do here will process between the main menu and submenu, we reserve it to pass errors. Add a button to our top nav, it will show up after all the default buttons we have in place. Add a custom setting to the settings page. When you save your settings this is processed, if you added a custom setting to the form you will want to process it here. 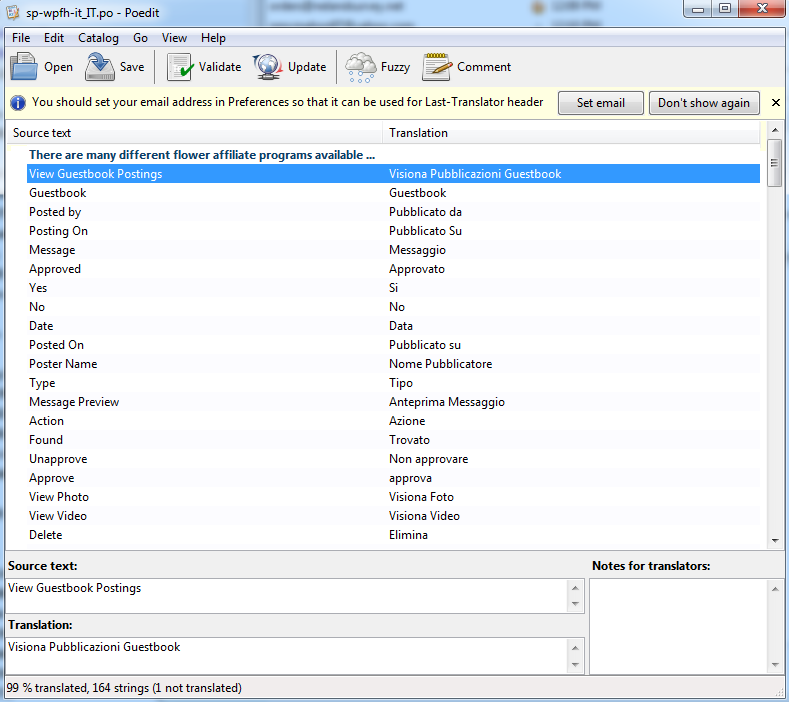 Funeral press now includes a localization system so you can translate the plugin to your own language using .po files. PO files use gettext function and it is the way that WordPress handles all localization. I will explain a little bit below on how to translate our .po files. This tutorial will also serve as a way to translate any WordPress plugin to your own language! Next you want to download and install PoEdit which is a 3rd party program you will use edit the .po file. Download PoEdit by clicking here. Once PoEdit is installed double click on the default.po file and it should open up in PoEdit. Now that the po file is open you want to go to File>Save as. The filename is very important, for this plugin you want to start the file with “sp-wpfh” and end it with your locale code which can find here. For instance if i were creating a spanish language file I would name the file “sp-wpfh-es_ES.po” . Click save and PoEdit will generate two files. a “.po” which is your translation file and a “.mo” which is for WordPress. Now that you have created your file you can go through and edit your .po file and translate it! To translate a term just click on the term in top section, you will see the actual term in the middle section and you write your translated term in the bottom section. I filled out the first one below. Go through each term and translate until finished. Once complete go to File >Save and you are done! Your Done! Please send us any translations and we will include it in the main package so you do not have to add it each time you update the plugin.